Roy Halladay walked off the mound Wednesday night and threw his hat to the ground in the dugout after being pulled in the third inning. The intensity in his eyes was real. Halladay labored through 95 pitches, needing 40 to just get through the first inning. He left after surrendering five runs on six hits over 3 1/3 innings, though he did collect nine strikeouts. "I was just trying to be too picky," Halladay said following the Phillies 9-2 loss to Atlanta. "Last year, feeling the way you do, you think, 'I can't throw an 86-mph. fastball to a general zone, it's going to get hit.' So you get to the point where you start to get picky." Each of the nine strikeouts Halladay collected came via off-speed pitches, yet all four of the hits that led to runs for the Braves came on fastballs. 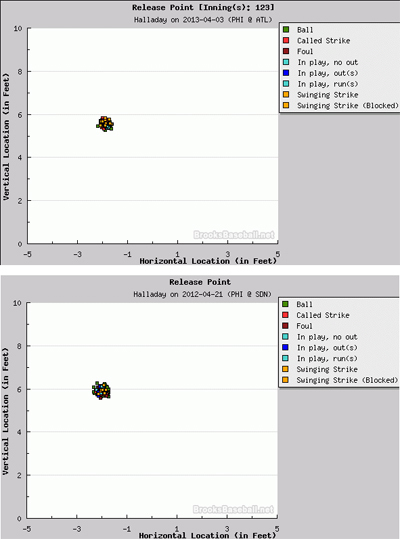 The chart below shows the location of each of Halladay's pitches separated by inning. Ignore the small numbers next to each block as they refer to the corresponding pitch number in an at bat. 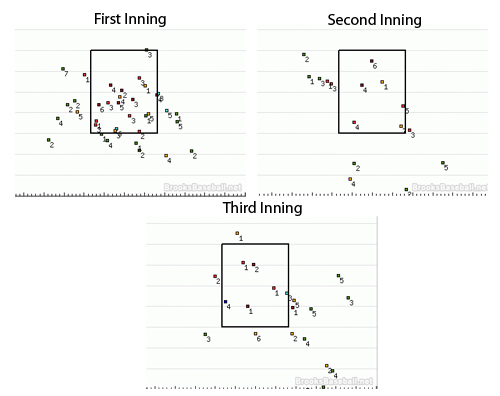 If you didn't know better, you may think you were looking at information from three very different pitchers, but this was Halladay's pitch location Wednesday night. "I've always relied on movement and not tried to pick sides of the plate," Halladay said. "And there were times where we were picking corners of the plate. I need to open it up and let the movement take care of itself." In addition to his wildness, Hallday's vertical release point Wednesday night was significantly lower than usual. For comparison, the box on the top shows his release points last night while the box on the bottom shows his release points from a start last season in April against the Padres. A lower release point and arm angle can shrink a pitcher's ability to induce ground balls and gives hitters a better opportunity to elevate a pitch out over the plate. Halladay fell victim to exactly that on Wednesday night. "I feel the arm strength is there where every pitch doesn't have to be on the black," Halladay said. "It just has to be down so we can get more ground balls and be more efficient. That's something we need to work on and address quickly." 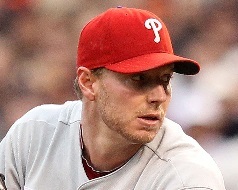 The spotlight will shine next on Halladay when he faces the Mets at Citizens Bank Park on Monday night. - Patrick Gordon is the managing editor of the Philadelphia Baseball Review. Follow him on Twitter @Philabaseball or contact him at pgordon@philadelphiabaseballreview.com.